Today's cookie was a bit more complicated to bake. 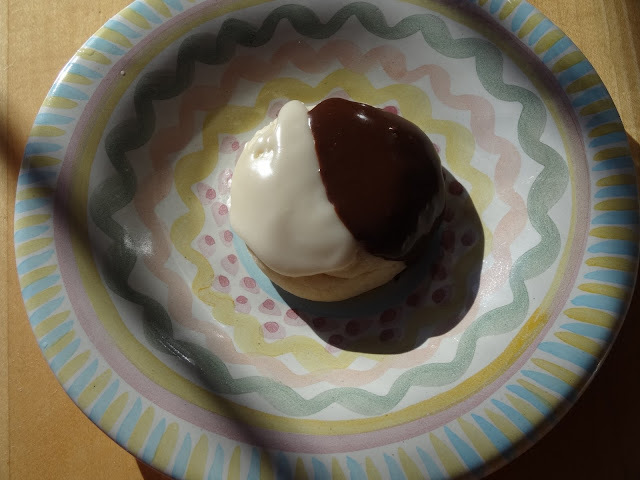 You know the black and white cookies you see at The Fresh Market? More like a tiny cake than a cookie? Well then you're more than familiar with today's cookie: Small Black and Whites. Now I know why I've aways bought them rather than baked them. The cookies are more like tiny little teacakes with two types of icing, baked with cake flour. They taste okay, but they were difficult to make and get the icing at the right consistency so it would run a little bit, yet not run all over the cookie. Looks so yummy. You go girl with all this baking. Half moon cookies!!!!! Now I want one...two...seven! How fitting the cookie and scripture...both dealing with patience.